Give your car or truck a treat with an official Miami Heat license plate frame and holder spreading team cheer on the road. 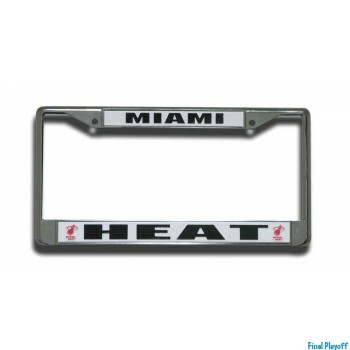 Whether your looking to buy a plastic or metal Miami Heat license plate frame we've got different designs to choose from. Plastic or metal Miami Heat frame holders are a great choice for being light weight, pre-drilled and economical way to show off your team pride no matter where you are. All Miami Heat orders are processed and marked for shipping same business day Monday through Friday 9:00am to 6:00pm pacific time excluding holidays and weekends. Rest assured knowing that your sports team merchandise is packed and shipped in house for an error free delivery. Check out other fabulous items in our catalog and bookmark our site for a future return on updated new arrivals.